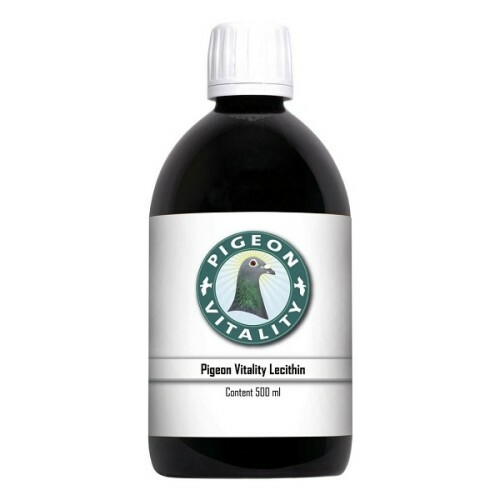 Lecithin Oil 500ml by Pigeon Vitality to the grain will increase the bioavailability an uptake of the fat in the grain from the body fluid. In this way Lecithin supports the pigeons with extra energy! Lecithin is a generic term that applies to any fatty substance composed of fatty acids, phospholipids, triglycerides, glycolipids, glycerol and choline. Although there are many benefits for the racing pigeons from lecithine, the most important function is as an emulgator which aid in mixing water and fat. – Increase uptake of the fat from the grain and boost energy in race. – A source of choline, which is an essential nutrient. – May help maintain healthy cholesterol levels. – Supports healthy liver function. – Can be mixed with all other Pigeon Vitality products. Beneficial for racing pigeon and is to be added to the grain before basketing . Recommended dosage is a dinner spoon (10 ml) per kilo grain. 1-2 days before basketing (depending on distance).